I took the test and managed 20 out of 20 (as I bloody well should have given how much material I’ve been reading on driving), much better than I did when I actually applied for my license years ago, but a few of the questions certainly gave me pause (though one often suspects that’s simply from the wording of the question). If all goes well I’m actually, as a bit of experiment, taking the U.K.’s written driving test (the “theory test” they call it), administered by the National Driving Standards Agency, in a few weeks. The literature I’ve been sent to study for it is a bit overwhelming. The reason I’m taking it is that I’ve always heard, anecdotally, that tests in places like the U.K. and Germany are much harder than the U.S., and I’m curious as to how that is reflected in our comparative safety statistics. To what extent one can be attributed to the other is an open question in my mind, and from what I can see, much of the literature (and if anyone’s got any good studies on this please share). But GMAC’s exercise does raise an interesting point about making driving tests a national standard in the U.S. The very fact that we get our licenses from the “Department of Motor Vehicles” (rather than the U.K.’s ‘Driving Standards Agency’) at least semantically implies the whole process is really about just getting cars on the road, rather than strictly regulating the quality of the drivers in those cars. Just getting people to signal these days is a bit of a challenge, much less getting them to signal the right distance ahead of a turn. 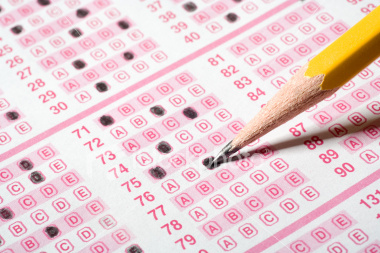 So, ‘fess up: how’d you do on the test? Comments Off on Only a Test. Click here to leave a comment. 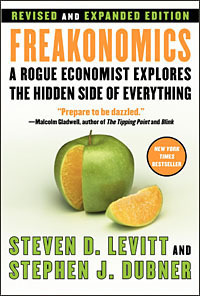 The excellent Freakonomics blog has posted a Q&A about the book, with the good questions provided by Annika Mengisen. The comments, as per usual on the Internet, range from intelligent discourse to reactionary fomenting. Comments Off on Getting My Freakonomics On…. Click here to leave a comment.